The ALS Low-Ride Level I Retention Duty Holster from Safariland combines reliable retention with ease of use. The open-top design guarantees maximum presentation speeds, while Safariland's impressive Automatic Locking System secures the weapon once holstered, but instantly deactivates with a simple, vertical draw. The standard Hood Guard ensures take-aways from unauthorized users is incredibly difficult. The guard's security potential can be further enhanced with the addition of an optional ALS Guard to upgrade the holster to Level II Retention. 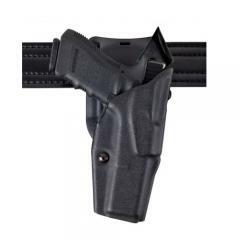 The holster fits either 2 or 2.25-inch belt loops with a ride height set 1.5-inches below standard, making it compatible with body armor. Offered in a range of finishes, Safariland's duty holsters are all crafted from durable thermal-molded SafariLaminate to offer maximum protection to handguns and sights. Light bearing model works great with my TLR-1.